At First Sight: Two very different girls are getting a late start at Rockwood Middle School' 8th grade class. Dina just moved from Massachusetts to Long Island and is having a hard time fitting in - no one really talks to her, people keep dumping potato chips in her backpack and everyone looks at her funny because she likes to film random stuff. Chelsea is one of the most popular girls at school, but she spent the first month of eight grade sick at home. But she's back and ready to take her spot as ruling queen of her class. And things are going according to plan, except for the fact that her best friends didn't tell her about the special projects everyone is doing for the 50th Anniversary of their school and now she has no team to work with. And, since Dina is the only other student without a team, their teacher decides to pair them up, and even tells them they should make a video, since Dina clearly likes making them. At first, Dina thinks that working with Chelsea might be her ticket to popularity but she quickly realizes it won't be that way. Chelsea couldn't care less about the video, she has her hands full with trying to stay on top of the social later and not letting anyone find out just how complicated things are at home now that her father has lost his job. But they are stuck together and it's make it work time! 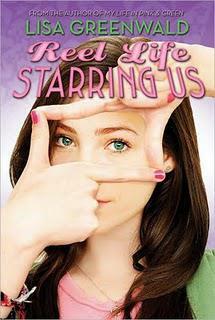 Second Glance: Reel Life Starring Us was a bit of a surprise to me as I had just finished reading My Life in Pink and Green and I guess I was expecting something very similar to that but it wasn't. However, it was a very nice book. Told in alternating chapters by Chelsea and Dina, this book deals with popularity and how our perception of people changes as we get to know them. Chelsea was, at times, hard to like though I felt for her because I know what's like when you dad looses his job and you kind of aren't sure what's going to happen, and I thought that part of her - those feelings - was very honest; but she was a wimp when it came to a lot of stuff regarding her circle of friends. Dina I liked more for she was quirky and liked doing her own thing yet she knew she wanted to be popular again and was very honest about it. She could be a bit sulky at times but she was fearless when it counted and resourceful. I found the ending a little too-neat, and I felt certain parts of the story weren't as developed as much as I would have liked, but I'm willing to overlook that, for the most part.